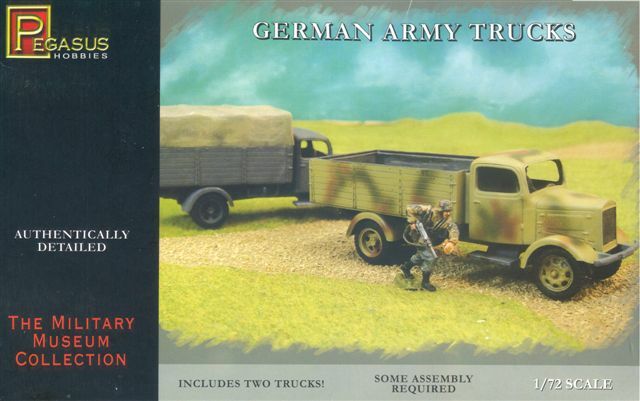 Looking at the box art from Pegasus Hobbies we have a photo of two assembled and painted truck models included within the box with a figure for scale. One truck is painted in a pre-1943 dark gray and the right one in a post-1943 three-color camouflage. This model is a bit of a conundrum for me. The model most resembles a Mercedes 3-ton capacity truck, comparable to the more well-known Opel Blitz. While certain features such as the bed and overall cab shape resemble that of the Mercedes L3000, it has enough vague features that it could be modified to resemble other German 3-ton trucks such as a Magirus S3000 or a Borgward B3000. The front grill is missing the large Mercedes Benz emblem common to many but not all Mercedes L3000 trucks. 1. This kit contains two small-scale German military trucks of the World War 2 period. Each truck consists of 15 injection-molded gray colored styrene parts on two small sprues, including a ¾ driver figure. The infantry figure on the box art is not included. 2. No decals markings are included such as license plates. 3. No clear window material is included. The kit is also missing headlights, Notek light, width indicators for the front fenders, handtools, tow hooks and windshield wipers. All these items can be scratchbuilt, borrowed or stolen. 4. 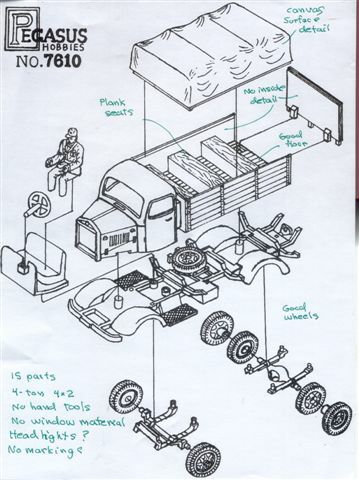 Here are the basic hand-drawn instructions for the assembly. Notice that the parts are not numbered. It’s pretty simple and dry-fitting parts indicated to me that it should go together well. The upper cab and bed part and the driver’s seat snap in pretty securely to the chassis. Parts like the steering wheel, the suspension and the wheels appear to need gluing. 6. 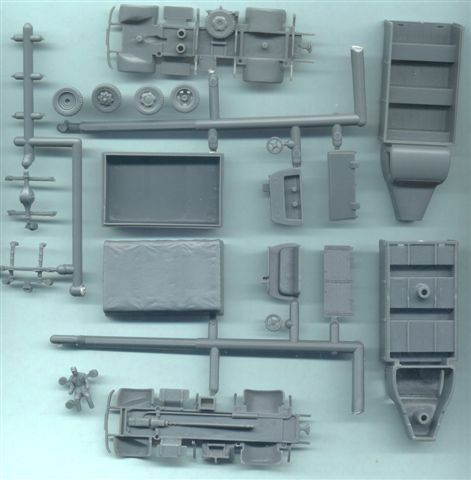 The scan of the parts shows the two model kits included within the box. Molding looks crisp with good definition and no sink holes or flash evident. This kit is quite simplified compared to the old ESCI and the Academy Opel Blitz kits. 7. The bench seats in the truck bed are molded in as boxes rather than the removable boards in the real truck. If we wish a good display model this is unacceptable so we’ll have to model the bed full of cargo or with the tarp on. The tarp has decent but not greatly accurate surface detail. 8. The bed interior is missing surface detail. 9. The fenders, transmission, bumper and spare tire are molded into the chassis, seen here at the very top and very bottom of the photo. 10. The running board below the doors have nice tread pattern but the steering wheel is a little thick. 11. A hole needs to be drilled below the radiator for the crank starter. 12. The towing pintle needs to be drilled and reamed out to make it hollow for a trailer hitch. 13. 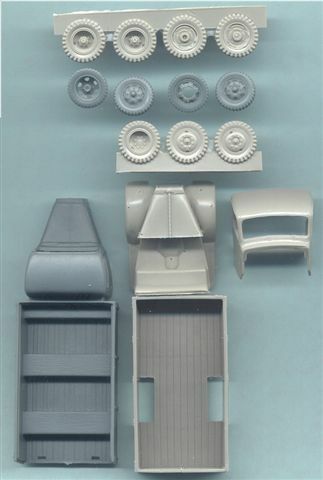 This scan compares the gray plastic Pegasus model at left with the light gray resin model by WSW Modellbau of the same L3000 S truck on the right. The WSW model is both narrower but has a significantly longer bed. I have some different measurements for this truck from different books; it appears that the bed came in varying lengths. According to "Mercedes At War" by Schiffer Publishing and the "kfzderwehrmacht" website, the dimensions of the real L3000 truck are: 6.25 meters or 6.7 m long, x 2.35 m wide x 2.6 m high. This means our 1/72 scale model should be: 87-mm or 93-mm long, by 33-mm wide. The Pegasus L3000 truck measured at 86 x 30-mm which means it is pretty close in length for the shorter length of 87-mm, but appears too narrow. Based on another reference the Pegasus truck bed of 48 x 30-mm closely matches the 1/72-scale truck bed measurements of 48.6 x 29-mm. 14. A thing that bothers me with both kits is the shape of the engine hood (bonnet) where it meets the cab. Based on photos of the real L3000, I believe the engine area should be narrower where it meets the cab then flare out in a soft curve to the width of the cab. The engine hoods of these models both expand evenly from the radiator back to the width of the cab. It is because of this apparent flaw in the cab and hood that I think both of these models could be converted to another 3-ton truck such as the Magirus S3000 or Borgward B3000 trucks. 15. In order to mold the cab and bed as one piece Pegasus added a spacer block to connect the two parts; if you wish a good display model you’ll have to hide this somehow, such as with a folded canvas tarp perhaps. 16. The darker gray wheels with the Pegasus model are noticeably smaller in diameter. The WSW wheels more closely match the size of other 3-ton capacity 4x2 German trucks such as ESCI’s Opel Blitz kit. 18. The hub detail is more accurate on the WSW wheels. 19. Overall the Pegasus L3000 model is a nice kit that can build to an accurate Mercedes truck or can be modified to produce a similar 3-ton capacity truck made by several other German companies of the period. It can be built with little modification to a fine wargaming or model for a novice; or it can be detailed into a fine display model. Mercedes At War, German Trucks & Cars In World War II Vol. IV. Schiffer Publishing, 1991. This is a good cheap, softcover reference book. Trucks Of The Wehrmacht, by Reinhard Frank, Schiffer Publishing, 1994.
http://www.kfzderwehrmacht.de/index.html : Good website with information on all types of vehicles from many nations during the WW2 period.